#4-Black and White:Use a black and white photo or mix color and black and white. This is so cute! Great take on the challenge! 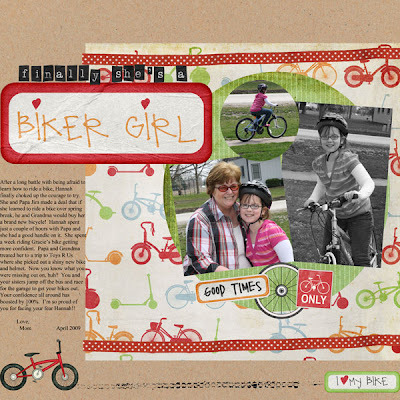 love the bicycle paper!! Is this digi????? Yep, it's from a digi kit on Sweet Shoppe Designs, they had 30% off all kits over the NSD weekend and I had to get it :o) At least that's what I told myself. hee hee They have an awesome Disney kit too - it's called "Do You Believe in Magic"...I've got some stuff coming up that I played with that one with. Way to go Hannah. Great job on the Challange Christine. Love how you mixed the b&w with color. That kit is perfect.